Valves are broadly lanceolate to slightly rhombic, and moderately sigmoid. The valve face is broadly arched. Apices are acutely rounded. The raphe is sigmoid and eccentric near the apices. The distal raphe ends are bilaterally deflected. Proximal raphe ends are variable, and may extend into the central area. The axial area is narrow and opens to a distinct, circular central area. Striae are decussate. At the apices, striae are more numerous and curve slightly as they continue from the valve face to the valve mantle. The valve length to width ratio is 3.8-4.9. Species in the genus Pleurosigma may be distinguished by measurement of the angle of divergence of the oblique striae from the raphe, termed "raphe angle" (Sterrenburg 2002). Sterrenburg (2001) reported +8° to +13° raphe angles for P. inflatum, compared to +17° to +21° for P. diversestriatum. The specimens imaged here show large variability in raphe angle within the population. Raphe angle measurements in this observed population (Edisto Marina, South Carolina) range from 10-17°. Pleurosigma inflatum is a marine taxon found in warm and tropical waters. However, it has also been observed in the North Sea and Normandy (Peragallo 1889), and the Newfoundland Banks (Lohman 1942). The specimens posted on this page are from estuarine waters of the Edisto Marina, near the coast of South Carolina. Pleurosigma inflatum (left) and P. diversestriatum (right) in dark field. The genus Pleurosigma has no less than five species, two being quite new, and both having the markings arranged diagonally, that is, with (what the Rev. W. Smith considers) cells placed alternately in contiguous rows. The outline of the largest (fig. 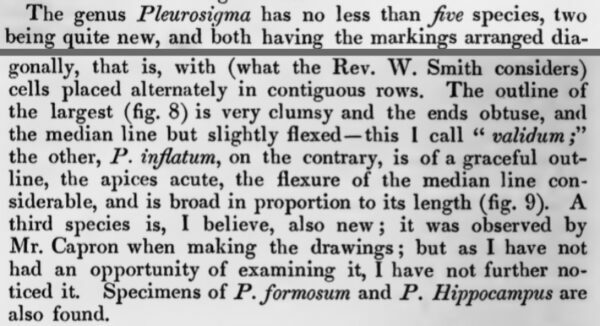 8) is very clumsy and the ends obtuse, and the median line but slightly flexed—this I call validum; the other, P.inflatum, on the contrary, is of a graceful outline, the apices acute, the flexure of the median line considerable, and is broad in proportion to its length (fig. 9). 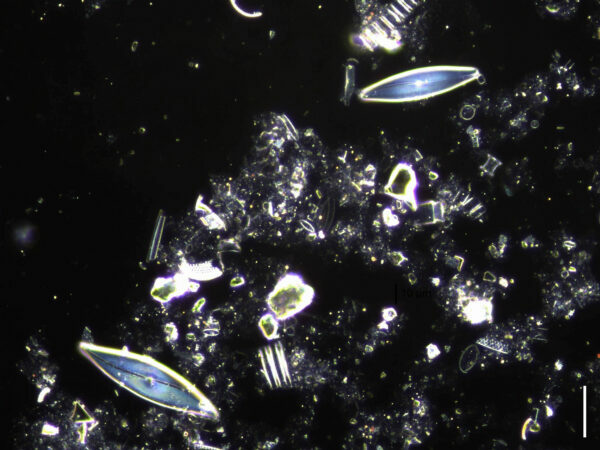 Hustedt, F. (1955) Marine littoral diatoms of Beaufort, North Carolina. Marine Station Bulletin 6:67 pp., 16 pls. Peragallo, H. (1889) Liste des diatomées francaises. In: Les diatomées II (J. Pelletan, ed. ), pp. 213-297. 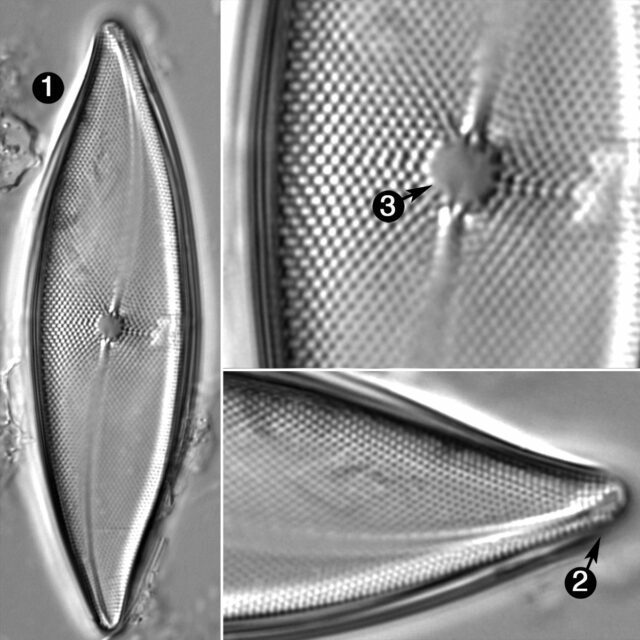 Shadbolt, G. (1853) A short description of some new forms of Diatomaceae from Port Natal Transactions of the Microscopical Society of London 2(1): 12-18. The valve face is arched, so that only a portion of the valve face will be in focus. Apices are acutely rounded. The raphe is sigmoid and eccentric. The central area is circular.